Earwax: most people find it messy and rather not have any people see the gooey substance in their ears. When you are bothered by an excessive production of earwax, you might think it’s necessary to choose professional solutions, such as having your ears syringed out by a doctor. With Alpine Ear Spray you can now give your ears a good rinse in the comfort of your own home, bringing multiple advantages. Removing excessive earwax not only keeps your ears clean and healthy, your earplugs will also be free of earwax. 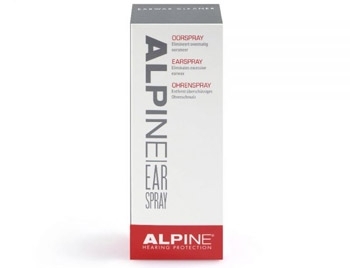 Alpine Ear Spray that way extends the lifespan of your earplugs and increases wearing comfort. The spray container includes a special nozzle tip, preventing pressure on the eardrum when applied. Removing earwax with Alpine Ear Spray not only results in fresh clean ears, the mild formula also helps you keep a healthy hearing canal.